The strobe has two switches. 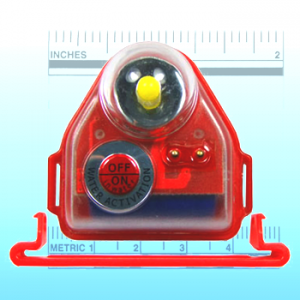 One is manually operated, labeled Off/On. 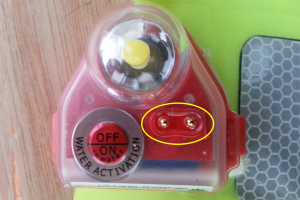 The other triggers automatically on submersion. You can test the automatic switch with a wet fingertip, described below. Place wet fingertip across the two brass contact points circled in the image. Depress switch labeled Off/On to cancel flashing. 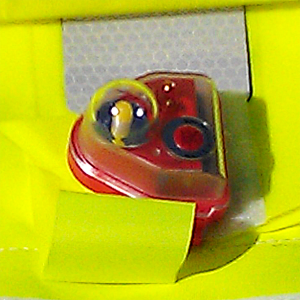 The strobe is fastened to the danbuoy using a simple retaining clip. The clip is shown below the strobe in the adjacent photo. Gently but firmly grasp the edge of the plastic clip with the pliers. 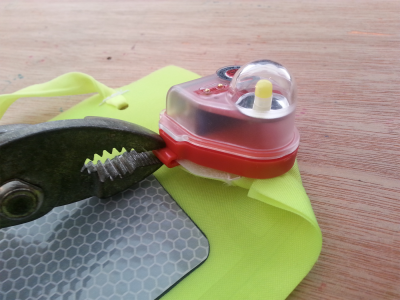 Squeeze the pliers to disengage the retaining clip. 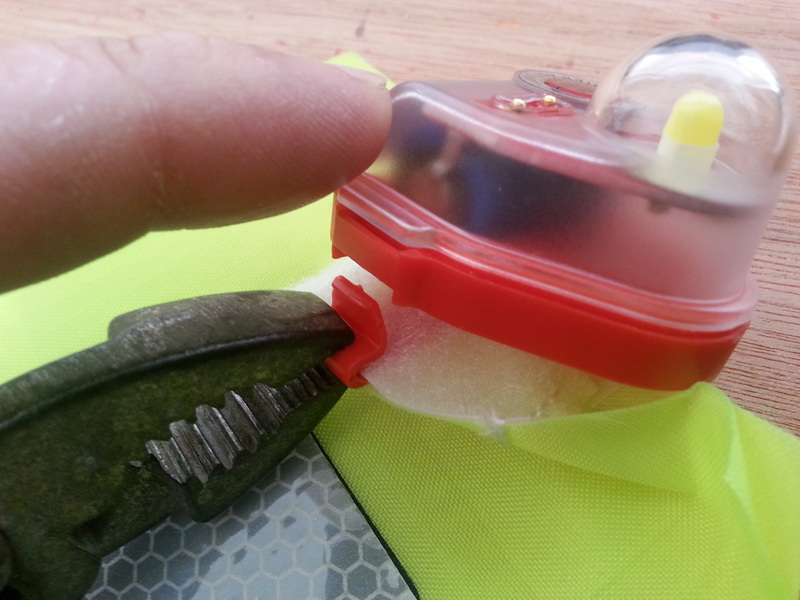 With other hand, pull strobe body upward until just clear of retaining clip. Place new strobe into position over retaining clip. Press strobe downward into position to engage both sides with the plastic retaining clip. Download strobe testing and replacement as Word document. Download strobe testing and replacement as Adobe Reader document. 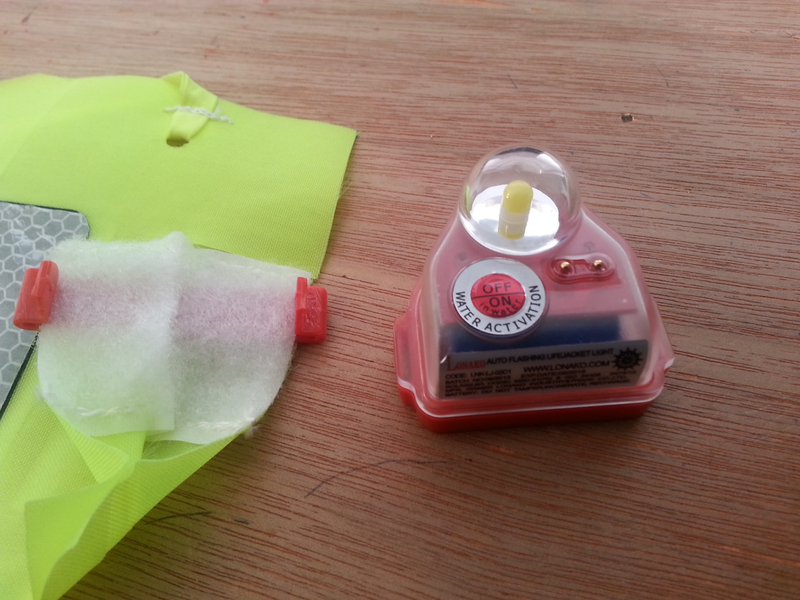 This entry was posted in Safety at Sea and tagged dan buoy, maintenance, strobe by Philip Thompson. Bookmark the permalink.